In the 18th arrondissement, the neighbourhood is considered the home of artists, writers and poets. 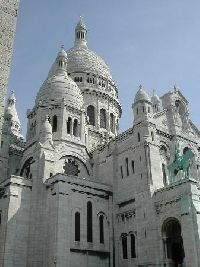 Its an uphill walk through winding and narrow streets to the church of Sacr Coeur at the top. But there is a bar or caf with street tables at every corner, there are flowers and plants at every window, and even the smallest streets are a spectacle. Music shops, bookshops and flowers make the uphill walk enjoyable. The cabaret theatres that once made Montmartre a place to avoid are still there in the lower part of the neighbourhood. Easy and cheap to live in, the metro connections are a bit of a walk.